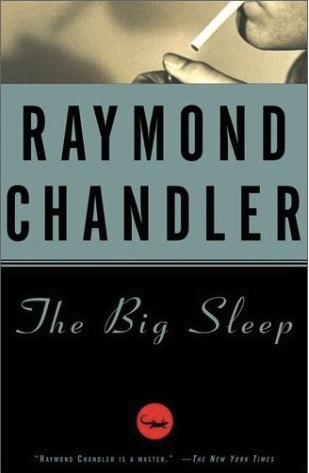 Raymond Chandler published The Big Sleep, his first novel, in 1939, when he was already 50 years old, but that did not stop him from revitalizing the detective story and inventing a new genre, gritty and dark and cynical. Cinephiles use the term film noir, associated with films like Billy Wilder’s Double Indemnity (1944), but the entire category would not exist were it not for Raymond Chandler and the popularity of his detective protagonist Philip Marlowe. In fact, Chandler co-wrote the script for Double Indemnity, as he did for Hitchcock’s Strangers On A Train (1951), and The Big Sleep has been adapted for the screen numerous times, most notably by Howard Hawks and starring Humphrey Bogart and Lauren Bacall. The Big Sleep also has the distinction of being beautifully written, setting it apart from its many aspirants. 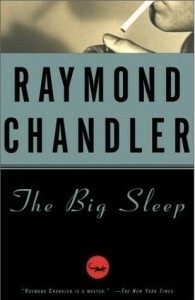 Like his protagonist Philip Marlowe, Chandler’s prose is straightforward and forceful. Dead men are heavy “like broken hearts”; the muzzle of a gun barrel is likened to the entrance to a dark tunnel; and a “few locks of dry white hair clung” to the scalp of an old man “like wild flowers fighting for life on a bare rock.” Chandler manages to be suspenseful and entertaining without sacrificing the quality of his writing; indeed, the level of suspense he achieves is made possible only by his masterful control of tempo and dialogue. Something must also be said for Philip Marlowe, Chandler’s protagonist narrator. He is described as tall and handsome, educated (he reads the paper every morning between attempts to solve chess problems) and principled, but willing to get his hands dirty in the service of his craft. He does not mince words or play games, particularly with women, and though not a single woman appears that he does not berate, slap, talk down to or insult, neither can any of them resist him, a fact that, as I type, may seem absurd or nonsensical but nonetheless manages to appear perfectly natural within the context of the novel. Think Fleming’s James Bond, who owes Marlowe an obvious debt, if Bond lost his English pedigree and penchant for expensive liquor. Ultimately, The Big Sleep deserves its acclaim and cult status: after seventy years, it has lost none of its potency, and both Marlowe and the plot are compelling enough to keep the pages turning with vigor.